This book is interesting in that it is a 5 chapter picture book. The chapters aren't long, but it does break it down easily into groups for early readers to get some time in reading. Jake is a smart, responsible 10 year old who is an only child. He has more pets than anyone at school including a dog, cat, rabbit, turtle, fish and bird. He cares very well for his pets in the mornings and evening, putting their needs before his own. Jakes friends love to come over and play with all of his pets and the author does a nice job in describing the antics of these animals. Being 10, Jake was finally old enough to go to Summer Camp for a month with his friend and family while his grandparents cared for his pets. Not really thinking it through, Jake agreed to pet sit for several friends through out the summer, including in June when he is scheduled to be gone! Jake did the responsible thing and kept his word to watch the pets and gave up his summer camp experience to do so. He was very mature in taking care of his promises. His parents were so proud of him that they gave him a special surprise. Wow, what a big decision. You would think maybe the grandparents could watch these extra pets or something. I don't know that I would have made such a huge sacrifice as that. Jake is a very mature kid! This was a cute story, the kids looked older than 10 in the drawings, but the theme of the story was very good. 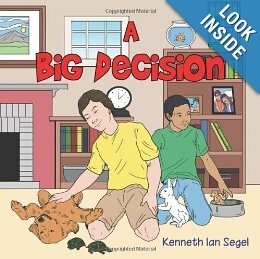 I hope it will encourage kids to make the right decision even if it means having to make sacrifices. Interesting...may look into this short book. I will have to look into this for my grandson. He loves animals and has a dog and a turtle. My granddaughter is younger and got her first fish for her birthday and is learning about the responsibility of a pet. It is a huge responsibility, and I'm glad there our books to showcase this plus the responsibility of stepping up and sticking to your promises.